The vast majority of legacy banking organizations have a concern regarding the loss of revenue to financial technology companies in areas such as payments, money transfers and personal loans. The amount of business at risk has been estimated to be as high as 25% in lost revenues. This is made more likely since 30% of consumers plan to increase their usage of nontraditional financial service providers in the future. In response to this threat, more than 8 in 10 traditional financial organizations have stated a plan to increase collaboration with fintech companies in the next three to five years. Similarly, almost half of financial services firms are planning to acquire fintech startups over the same period. The question is whether these new partnerships can successfully preserve the culture of the fintech provider, while allowing legacy banks to be the hub of the consumer’s financial relationship? This report is not intended to provide a review of all of the fintech organizations in the marketplace. Instead, this report is a view of the quickly changing banking ecosystem. We would like to thank Microsoft for their partnership and sponsoring the Banking + Fintech research report in collaboration with Efma. Their partnership has enabled us to create an in-depth review of the competitive landscape and to better understand the impact across all components of the financial services ecosystem. 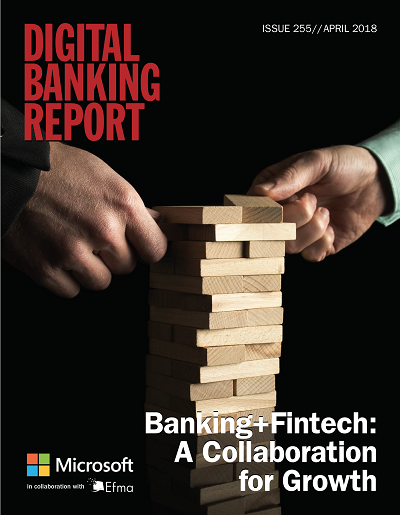 Once considered competition, fintech firms are now being viewed as potential collaboration partners, providing new digital technology and a commitment to innovation.